Grilled tandoori lamb served with beans and a low-fat raita makes a healthy alternative to a classic takeaway lamb curry, which is often loaded with hidden salt and fat. 1. Place the lamb in a shallow dish. Mix together half of the yogurt and the curry paste and spoon over the lamb, turning until well coated. Cover and chill for at least 30 minutes or overnight if possible. 2. Meanwhile, to make the raita, squeeze the excess liquid out of the cucumber and mix together with the remaining yogurt and the mint. Chill until ready to serve. 3. Remove the lamb steaks from the marinade and grill on a rack under a high heat for 5-6 minutes on each side, until lightly browned but still a little pink in the centre. 4. Meanwhile, cook the beans in a pan of boiling water for 5 minutes. Spray a large pan with sunfl ower oil and sauté the mustard seeds and shallot for 3-4 minutes, until golden. Drain the beans and add to the pan with the garam masala and toss together for a minute or two. 5. 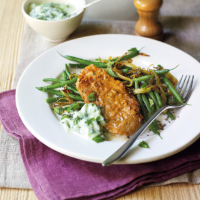 Serve the lamb steaks straight away with the green beans and a drizzle of cucumber raita.